Free yourself of the constraints linked to business travels thanks to an all-in-one mobility solution! 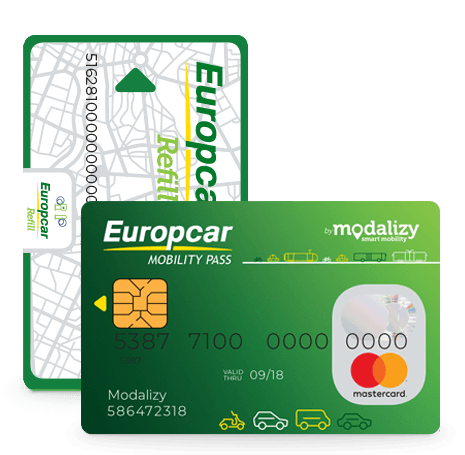 Manage the expenses linked to your business travels using your personal Europcar Mobility Pass Mastercard® and Europcar Refill cards. Thanks to Europcar Mobility, our company makes less expense reports, which saves us time and money. We have a complete reporting that also allows us to analyze all our mobility expenses. In addition we enjoy significant VAT benefits. As a user, I appreciate the ease of finding the appropriate and available means of transportation, the user interface of the mobile site and the dynamics of Europcar Mobility with a growing number of partners as well as partner countries. Thanks to Europcar Mobility, I no longer need to keep all my receipts. I receive a detailed invoice every end of the month covering all my mobility expenses. It's really great ! Now that my team uses the Europcar Mobility Pass Mastercard®, stressing about arriving on time for a meeting is part of the past ! With Europcar Mobility, the car is no longer the only way of getting from A to B. Take the train, tram, underground, bus, taxi or rent a bicycle in all simplicity. Manage your employees’ cards via a secure platform. Monitor your mobility expenses and that of your employees. Receive a single itemised invoice for all the travel expenses of your company, meaning you no longer need to collect receipts for each payment! Recover VAT on a maximum amount of expenses linked to your business travels.